Call me a Scrooge, but I'll pass on this synthetic version of that most humanistic of tales. 96 min. Buena Vista Pictures Distribution. Director: Robert Zemeckis. Cast: Jim Carrey, Gary Oldman, Bob Hoskins, Colin Firth, Robin Wright Penn. In Disney's A Christmas Carol, fabulously detailed digital sets bring Dickensian London to life. But it is not buildings that make us feel something. Nor is it showy, swooping, impossible "camera moves" and other trickery made possible by digital animation and motion-capture technologies. If an audience is to feel something from A Christmas Carol, the emphasis must be on hurt, hardship, pain, fear, sincerity, good cheer and, above all, love. Fear excepted, most of these emotions seem like afterthoughts in Robert Zemeckis' new adaptation of the Charles Dickens classic. In personally adapting Dickens' novella, Zemeckis has written a mostly faithful, lean, tough-minded script that retains the essential shape of Ebenezer Scrooge's redemptive story arc. Cold-hearted usurer Scrooge abandoned a chance at true love for what he calls "the honest pursuit of substance." Money is a lover that will never question him and—due to his avid penny-pinching—never leave him. But when a series of ghosts visits him, Scrooge systematically faces the best and worst of his past, the patheticness of his present, and the cruel end that is his future. Only by hitting bottom can the old man discover he has nothing to lose and everything to gain by being generous and open-hearted. The problem here isn't the story—which is essentially unbreakable; it's in the storytelling, which too often comes across as rote. Horror fan Zemeckis connects most with the passages detailing the hauntings of Scrooge. Zemeckis' scary theatrics and sharp timing effectively create suspense as we await the ghosts—but don't maintain tension once when they show up and turn Scrooge's home into the Hanuted Mansion on steroids. Unfortunately, Zemeckis is still enamored of the weird spectacles enabled by "mo-cap" and fills this A Christmas Carol with more of those 3D snowflakes (the best part of The Polar Express), slapsticky action, and nasty-looking waxworks that purport to be people. 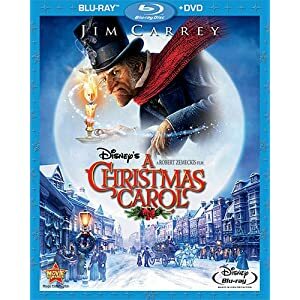 Disney's A Christmas Carol allows Jim Carrey to play four roles, one of them at five different ages: Scrooge as a young boy, teenage boy, young man, middle-aged man and old man, the Ghost of Christmas Past, the Ghost of Christmas Present and the Ghost of Christmas Yet to Come. To paraphrase The Mask, somebody stop him! Carrey's idea of Scrooge is to affect a strange English dialect (one that often sounds more like a caricatured Indian accent); as far as his physical performance, captured and rendered in pixels, Carrey's exaggerated mime can be just as distracting when it's uncontained. The real master class here is conducted by Gary Oldman, whose Bob Crachit and Tiny Tim (as well as his Jacob Marley) demonstrate true range and delicacy. The one saving grace of mo-cap is to enable such liberating exercises in pure acting (though radio, audiobooks and the stage afford similar opportunities). All the characters still look like airbrushed rubber dolls, whether played by Colin Firth, Bob Hoskins (whose Fezziwig does a preposterous full body flip), Robin Wright Penn, Cary Elwes, or Fionnula Flanagan. Walt Disney himself used to obessively pursue perfect photo-realism from his animation artists, until he realized it was a fool's errand to take expressionism out of the equation, so it's ironic to see motion-capture animation touted under the Disney banner. Call me a Scrooge, but I'll pass on this synthetic version of that most humanistic of tales. 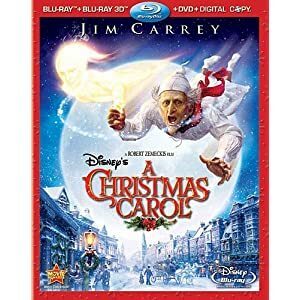 Regardless of what one thinks of the film, Disney's A Christmas Carol represents a pivotal home-video title, as it is one of the very wave of Blu-ray 3D titles. Available in a Blu-ray + Blu-ray 3D + DVD + Digital Copy combo pack, the set makes for a great show piece, state-of-the-art reference-quality material to impress friends and family with that expensive 3D HDTV you insisted on buying. Because the technology is so cutting edge, you may find it necessary to tweak/calibrate/recalibrate your set to maximize the 3D effect, but once your settings are just right, you'll be suitably impressed with the illusion of depth and screen-popping, eye-popping effects. Unlike the old-school anaglyph 3D seen on some pre-Blu-ray-3D titles, the new discs interface with the new 3D HDTVs to produce an image with undimmed true color: the result is a brand-new home viewing experience of considerable novelty and snap. The image remains crisp while reaching out to your seat. The process isn't utterly flawless, and your mileage may vary based on viewing conditions: "ghosting" or "crosstalk" (left eye/right eye argument resulting in doubling or blurring of an image) can pop up on occasion, though minimally if watching under optimal conditions of lighting and distance from set. Generally, one gets all the awesome protruding effects and breathtaking depth (especially with the translucent ghost of Jacob Marley) audiences enjoyed in theaters. On a separate disc, Disney delivers a pinpoint perfect 2D hi-def transfer (also available as part of a Blu-ray + DVD combo pack). Colors are stable and accurate, and detail and texture razor-sharp. Contrast is excellent and black level rock solid. This is a rich image of considerable depth: no complaints here. Audio comes in a potent DTS-HD Master Audio 5.1 mix that's an immersive wonder: dialogue gets nicely prioritized, and music is full-bodied, but what most stands out is the awesome effects work, doled out over the channels for maximum immersive effect. The bonus features do a nice job of giving a picture of the film's making, starting with the Picture-in-Picture track Behind the Carol: The Full Motion Capture Experience (HD). This viewing option allows one to watch live-action footage of the actors on the "mo-cap" stage, which is much more fascinating than the featre itself. This footage can fill the screen or be viewed side-by-side with the finished product. This is well-worth-watching, especially to see the brilliant Gary Oldman play Tiny Tim, Bob Crachit and Jacob Marley! The commentary track with director Robert Zemeckis allows the director to wax enthusiastic about motion-capture filmmaking and this film in particular, as he explains his concept and its execution. "Capturing Dickens: A Novel Retelling" (14:43, HD) does much the same, collecting behind-the-scenes clips and cast and crew comments. Countdown to Christmas Interactive Calendar (HD) is what it sounds like, an odd little feature. "On Set with Sammi" (1:52, HD) is a pointlessly short piece wth young actress Sammi Hanratty discussing making the film. In the promo department are various trailers and "Discover Blu-ray 3D with Timon & Pumbaa" (4:23, HD). BD-Live sends viewers to additional online content. The above extras are all found on the Blu-ray + DVD combo pack. Exclusive to the Blu-ray 3D set—and housed on the Blu-ray 3D disc—are two other extras: "Mr. Scrooge's Wild Ride" (2:33, 3D/HD), a featurette on the 3D effects, and "Disney Blu-ray Sneak Peek" (1:25, 3D/HD) with 3D clips of Disney's The Nightmare Before Christmas, Alice in Wonderland, Tron Legacy, among others. The revolution is being televised with Blu-ray 3D! All site content © 2000-2019 Peter Canavese. Page generated at 04/20/2019 11:49:42PM.